There’s a lot to be said about the construction of your walk-in unit, so we’ll break it down into prefabrication, finishes, insulation, and accessories. The simplest walk-in unit is typically a prefabricated model. Assembled either at the manufacturer or on-site, these models are a drop-in refrigeration unit that requires little setup and no costly technician! These start at 5 foot by 5 foot and increase by 1-foot increments, but what you gain in simplicity, you’ll lack in customization. Also, you will need to hire an electrician as these don’t simply ‘plugin’ but rather need to be hard wired. Walls, both interior and exterior, typically are aluminum, but you also can spec painted zinc-prepped steel, painted aluminum, smooth anodized aluminum, embossed aluminum or stainless. For interior walls, remember that smooth surfaces are easier to clean than embossed, and dirt is more apparent on lighter surfaces than darker ones. If you store acidic foods in the walk-in, a painted surface is better than exposed metal. If your stores are near salt water, you will want to avoid aluminum and spec stainless walls, especially if the walk-in is located outside. The wall, floor, and ceiling panels are insulated to maintain the internal temperature of your walk-in, and most manufacturers use foamed-in-place urethane as opposed to laminating the metal on polystyrene. While this is less expensive, it’s also less efficient. Polystyrene slabs don't have the same insulation factor than 4" foamed in place urethane". In fact, some locations like CA have minimum insulation requirements. Since new federal regulations were adopted several years ago, wall and ceiling panels must have a minimum R-factor—a thermal resistance value— of 25 or greater. Floor panels must have an R-value of 28 or more. 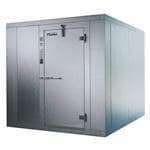 (Walk-in freezers must have an R-value of 32 or greater.) You can opt for thicker panels up to 6 inches, and these will have a greater insulating factor (great for restaurants in extreme environments). Also, note how the floor is constructed. The ideal setup is an insulated floor on top of an insulated concrete slab, quarry tile, and grout, and topped with a thermal break. Local codes may also play a role in how your walk-in is constructed. Don’t forget that law now requires that all walk-ins have an air curtain or vinyl curtain as well as door closers on all walk-in units! Not only do these reduce refrigeration loss, but they prevent humidity from leeching into the box itself. Food lasts longer in a dry environment, and your evaporator will have to work less to maintain the cavity. This will help improve the efficiency of your unit, so it’s true for your restaurant’s benefit. Ramps, coated shelving, and dunnage racks are all great additions that can improve workflow, reduce accidents, and increase organization. Ramps work well for restaurants that tend to have heavy loads and bulk purchases, as you can simply wheel a cart into the unit itself. Coated shelving and dunnage racks are great for organization and help you utilize the most space within the unit. On a final note, consider spending the extra money on an alarm. A few hundred dollars off the bat for an alarm is cheap compared to thousands of dollars of spoiled food.